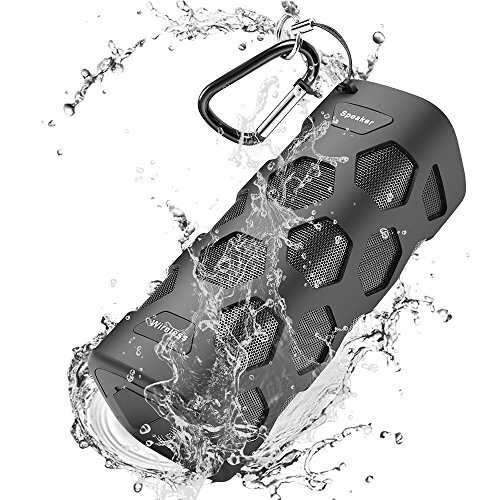 Mugo 20W Bluetooth Speaker Waterproof for 24 hrs Music Streaming & Hands-Free Calling, Power Bank/10W + 10W Dual Driver Speakerphone, Built-in Mic, Rechargeable Battery and NFC Support. √ Dimension : 6.7 x 2.6 x 2.6 "
♬【5200mAh Power Banks & Hands-Free Calling】 : Enjoy the wireless speaker as a loud speakerphone for free your hands with built-in Mic when calling. Be convenient for your life, Outdoor Portable Speaker and Power bank 2 in 1. Supported USB output. This is a best powered bluetooth speaker with lots of functions, don't miss it. DON'T WAIT, GET YOURS NOW!!! ❤【WHAT YOU GET】:Mugo Bluetooth Speaker, MicroUSB Charging Cable, User Guide, 3.5mm Audio Cable, Mountain climbing buckle hook, Gift Box, 45-DAY MONEY BACK, 18-MONTH WARRANTY, 100% satisfaction customer service and 24 hours email support makes your purchase absolutely risk-free! It would be a wonderful festival gift for your beloved ones!!! If you have any questions about this product by Mugo, contact us by completing and submitting the form below. If you are looking for a specif part number, please include it with your message.